July small things is really very small this month. We've managed less new things than we normally would and some of these have been quite unsuccessful from my point of view. They are also a little more crisp orientated than I had wanted them to be! First up is the difficult to find images for Deli crisps range by Walkers. They don't mention them on their website and the only real references you can find for them are on blogs - as a result of their blogger launch in June. The Deli tag seems to suggest something rather special and the non-promotional price tag of £2.39 per 185g would also seem to confirm that they are upmarket. The ingredients also sound upmarket, including balsamic vinegar from Modena and sea salt from Anglesey. Name-checking where the produce has come from seems to be something that Walkers use as part of their marketing strategy and it works for me. 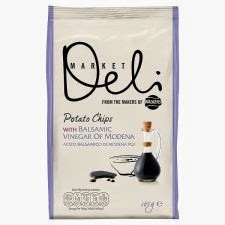 We've tried two of the range so far - the balsamic vinegar potato chips and the salt and pepper tortilla chips. I was really not at all impressed with the vinegar ones. The flavour was subtle to the point of barely being there and the chips themselves didn't feel all that high quality. I would not recommend these at the promotional price of £1.50, let alone at full price. The salt and pepper ones were better. 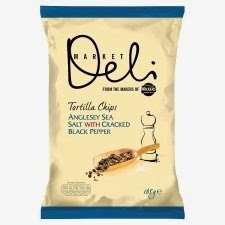 It was interesting to have that flavour on tortilla chips and that novelty gave it a few more points for me. Again though, I'm not sure if I would buy them at full price. I'm intrigued to try the pitta chips and so I will do but all in all, not wildly impressed. Much of the range is being sold at £1.50 a bag in Tesco or £1.59 on Ocado. Other flavours include Cornish cheddar and chilli and tomato. Something that has been far more successful are the new Oasis Mighty Drops. This isn't a new concept - several of the squash producing companies seem to be cashing in on this idea - highly concentrated squash that can be added a few drops at a time to big glasses. Mighty Drops comes in three flavours - Tropical Mango, Raspberry Lemonade and Mixed Berry. I've found these little bottles fantastic. I can't choose between the three flavours as to which is my favourite. I've been having them with sparkling water and they have been so refreshing in the evenings where the temperature has been so high and the atmosphere so muggy. The bottles are a little pricey (Sainsburys are currently selling them at £2, Ocado at the full price of £2.49) but they do go a very long way. I think that I managed to use one bottle on about six 2l bottles of sparkling water. Anything that forces me to keep hydrated is a bonus too - I'm well aware that I'm not all that good at drinking as much as I should be. My final July small things isn't something foodie but something for the kitchen. I've recently discovered, thanks to the Bounty pack, Dettol's surface wipes. Ever since having a baby myself, I've realised just how handy wipes are - doing all those little jobs around the house. This takes that to the next level. I love these and really wish I'd found them sooner! I bought all of these products myself and reviews are all my own words. Falafel Footballs: Recipe from 'I Can Cook'.